The Unity Day is celebrated in Russia every November 4th. It is also a general public holiday which means on that day every school, office, and business will be closed so that everyone can come together and celebrate this important day together. It is said that the holiday is relatively new because it has only been observed since 2005. But, actually, the root of the Unity Day is very deep and the 4th of November has been a very special date since as early as 1612. For an indepth understanding of this day, let us see these 4 facts about National Unity Day in Russia. When Ivan the Terrible from the Rurik dynasty died in 1584, the Time of Troubles began in Russia. The death marked the end of the Rurikids which then led to a widespread disorder in Russia. There was a national existential crisis and the collapse of the Russian state. The crisis happened from 1584 to 1613, ended by the establishment of the Romanov Dynasty. During this time, a group of Russian nobles called the Seven Boyars opened the Kremlin’s gate for the Polish troops because they wanted to bring Wladyslaw, a Polish Prince at that time, to the Russian throne. This clearly became a threat to the power in Moscow. The invasion of Polish drove Patriarch Hermogenes, a Russian religious leader who served the Orthodox Church, to call upon all Russians to unite and push the invaders out of Moscow and defend the church. This was the seed of the National Unity Day, and Patriarch Hermogenes has been glorified in Orthodox churches eversince. There was a pause in the movement, though, after the leader passed away. The gap stretched from March until September 1611. It was Kuzma Minin, a district leader and meat trader in Nizhny Novgorod who sparked the fire back in Russian people’s hearts to move for their country. He asked people to join the volunteer troops. Minin and his wife donated all of their money and jewelry to the army followed by the people who chipped in one third of their wealth to support the troops. They, then, appealed to Prince Dmitry Pozharsky – Novgorod’s Prince at that time – to lead them going against the Polish. He agreed only if he was provided an aide to look after people’s money being used for the cause. The people chose Kuzma Minin for this position and made a duet of leaders that both they chose and trusted. This movement became the motor that started rallies by all classes and ethnic groups in Russia. The victory belonged to the Russian troops and Polish got defeated. This was why the date was named Unity Day. When the voluntary corps of Nizhny Novgorod ambushed the Kitai Gorod – Moscow’s external wall – to drive the invaders from the heart of their nation, they were marching under an icon of Our Lady of Kazan (widely known as Mother Mary.) The fight gifted the Russian state a glorious victory, and they dubbed Our Lady of Kazan as the protector of their land. This is why, other than celebrating National Unity Day, the followers of Orthodox Church in Russia also remember the day as the day of Our Lady of Kazan. It is a feast day for them. This holiday has only been observed since 2005 officially. But, despite the history behind it, a lot of Russian today don’t actually know why they have to take the November 4th as a special day. Most of them couldn’t even identify the holiday correctly and just happily took it as another day off. To them who understand the importance of the date, though, Unity Day means going to the monument to Kuzma Minin and Dmitry Pozharsky in Nizhny Novgorod and lay flowers there to honor them. In Moscow, the Russian March takes place and is attended by thousands of people. In 2006 the march got banned, but still got carried out anyway. The most common things people have on the Unity Day are flag hoisting, marches, firework festival, speech from the President, broadcasts of national anthem and heroic movies on wide screen, and other historical and cultural programs. To make the long history of Unity Day short, we can point out things like; the root of this important day was dated back to 1612 when Patriarch Hermogenes called upon Russian people to unite and fail the mission of the Seven Boyars to put a Polish prince on the throne. His fight was continued by Kuzma Mimin and Dmitry Pozharsky which eventually led to victory for the Russian state. People of Russia from all classes and ethnics got together voluntarily and drove out the invaders on November 4th, 1612. The Time of Troubles ended and Russia gained back its power. 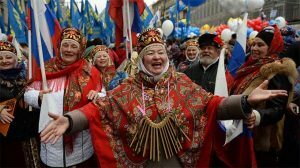 Those are the four facts about National Unity Day in Russia we could put together to make the very long history of the important date more understandable and easier to digest. What can you learn from this article? Exactly. The power of people is the strongest form of politic everywhere in the world, including Russia.